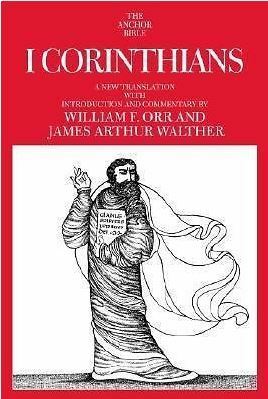 I Corinthians is Volume 32 in the Anchor Bible series of new book-by-book translations of the Old and New Testaments and Apocrypha. William S. Orr and James Arthur Walther are, respectively, Professor Emeritus and Associate Professor of New Testament at the Pittsburgh Theological Seminary. St. Paul's I Corinthians stands as one of the Bible's greatest masterpieces and certainly one of the greatest contributions to Christian theology. The epistle "To the Church which is in Corinth..." addresses itself to the basic tenets of Christian faith as well as down-to-earth matters of moral conduct and standards of Christian living, including such topics as speaking in tongues, the Resurrection, the Lord's Supper, and the problems of marriage. This letter also includes Paul's memorable definition of Christian love. The man who laid the foundations of Christian theology remains important not only for what he taught, but for who he was. Professors Orr and Walther ask--and answer--"What Kind of Man Was Paul?" in their own extended introductory biography of the man: a look at his life, his ministry, and his beliefs.